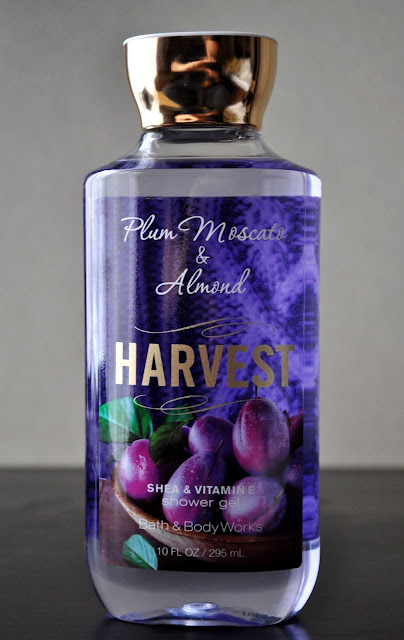 From my vault of bathing products, December's Shower Gel is from 2014's Fall Collection: Plum Moscato & Almond Harvest. Plum Moscato, Toasted Almond, Blackcurrant, Lily Blossom, and Vanilla Woods. The Plum Moscato and Blackcurrant are the most prominent notes, giving the shower gel a wonderful chilled, sweet berry scent without being overbearing; whereas the accents of Toasted Almond and Vanilla Woods provide a underlying warmth. I want to say Plum Moscato & Almond has a similar fragrance to one of the shower gel's in the permanent lineup, but I can't put my finger on it...maybe Dark Kiss? However, the note of Toasted Almond gives this shower gel its own festive twist, all the while, giving me visions of dancing sugar-plums this Christmas season.